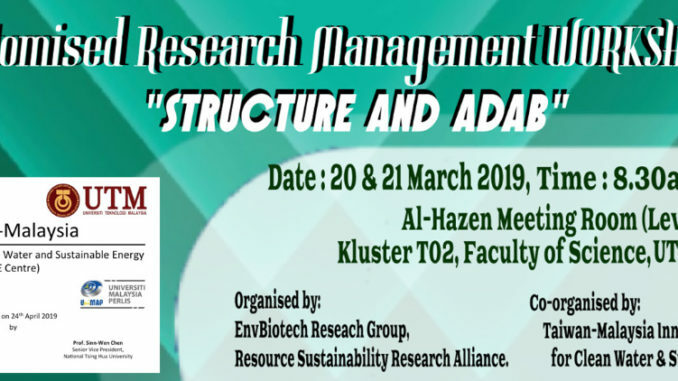 A 2 days workshop on “Customised Research Management: Structure and Adab” will be held at T02, Department of Bioscience on the 20- 21st March 2019. This workshop provides a platform for young researchers and others who are still searching for meanings in research and those who want to learn more about managing research. Participants will be personally coached during and post workshop by a special invited facilitator Prof Dr Hj Wan Mohtar Wan Yusoff. Participants will be coached to write or express clearly the statement of strategic and implementation plans, customised to each participant needs in the quest to find the truth in events for excellence in publication and community engagement.